Margaret Atwood was in Ottawa yesterday to present her new book The Heart Goes Last. She was interviewed by Alan Neal from CBC at the Southminster United Church on Aylmer Avenue. The place was packed, but I managed to get a seat not too far from the stage. The audience consisted mainly of women of a certain age, even though I spotted a few men here and there. The Heart Goes Last tells the story of Charmaine and Stan who have been living in their car for a while. When they are offered a chance to participate in the Positron Project, a cooperative living experiment, they decide to accept. They will live alternating months in a house and in a prison in the town of Consilience. When Charmaine has an affair with the man who lives in their house when they are not there, odd things start to happen, and Stan’s life is threatened. 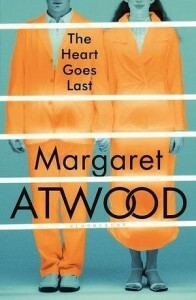 Margaret Atwood started to write the story as an online serial on the Byliner website. She was making it up as she was going along. She wanted to have the same experience as Charles Dickens when he was writing The Pickwick Papers. She wrote 4 episodes, and then her publisher told her that they wanted her to make the story into a novel. In order to do this though, she had to modify a few things. Writing for a serial is different from writing a book. In the online episodes, she needed to remind readers of what happened in the previous installments, but for the novel, she couldn’t do that, as the reader would wonder why she repeated the same information over and over. The author also mentioned that she once tried to get more organized with her writing, but it didn’t work out for her. In fact, she thinks of her method for writing as mouse in a maze. She tries a path, and if it’s a dead end, she tries another and another until she is satisfied with the result. Sometimes, she is surprised by what comes out. She uses posted notes to guide her, but the structure of the story is not pre-formed. So a lot of rearranging and editing needs to be done afterwards. Her advice to new authors: write whatever you want. It is easier to write truthfully when you think nobody is going to read it. When you find a publisher, that’s when you need to edit your text. During the event, Margaret Atwood talked about sexbots, social media, the Canadian election and utopia vs. dystopia. She also told the audience several stories: how she ended up going to ComicCon in LA, or how she met a flight attendant who had published a book about dominatrixes. All were told with perfect timing and a wicked sense of humor. The story I liked the most though was one she told in response to a question about her books being force-fed to students in schools across Canada. She was having a party at her house in Toronto for Canadian writers. One of the authors wasn’t feeling well and thought she was having a heart attack. Paramedics were called. When they arrived, they attended the sick person and, after a while, one of the paramedics told the other: “Do you know whose house this is?”. When his companion replied that he didn’t, the paramedic said: “It’s Margaret Atwood’s house”. His companion answered: “She’s still alive?!”. With this story, the author wanted to illustrate that most writers that are taught in school are dead and that she was lucky to be able to see this while she was still alive. As for the author who thought she was having a heart attack? It was in fact a big ball of gas stuck in her chest. 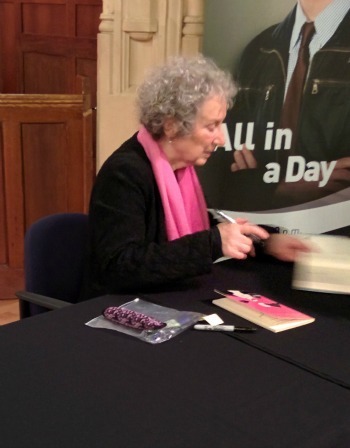 Read my article on when I met Margaret Atwood for the first time.